Alone among a gathering of preening male artists commandeered by her husband, Alfred Stieglitz, to represent American Modernism, Georgia O’Keeffe began painting the most phallic of topics, the New York Skyscraper. True, Stieglitz had photographed the buildings rising under his watchful view finder camera from the window of the rooms of the couple at the Sheraton Hotel, and, also true, Charles Sheeler painted clusters of tall buildings, but it was O’Keeffe, who confronted each high rise building, singularly, alone, one at a time. It was she who was able to capture the experience of living and walking among these new structures. According to Art and the Crisis of Marriage: Edward Hopper and Georgia O’Keeffe by Vivien Green Fryd, “A tradition of figuring the skyscraper as implicitly masculine, and therefore, phallic, extended back to Louis Sullivan and before, when visual conventions of representation in portraiture and other genres routinely assigned phallic objects to males.It was not until the influence of Freud was felt, however, that these associations became codified and clearly understood within American culture…” Undaunted O’Keeffee marched into this newly emerging field of masculinity and produced the best paintings of skyscrapers in the past one hundred years. 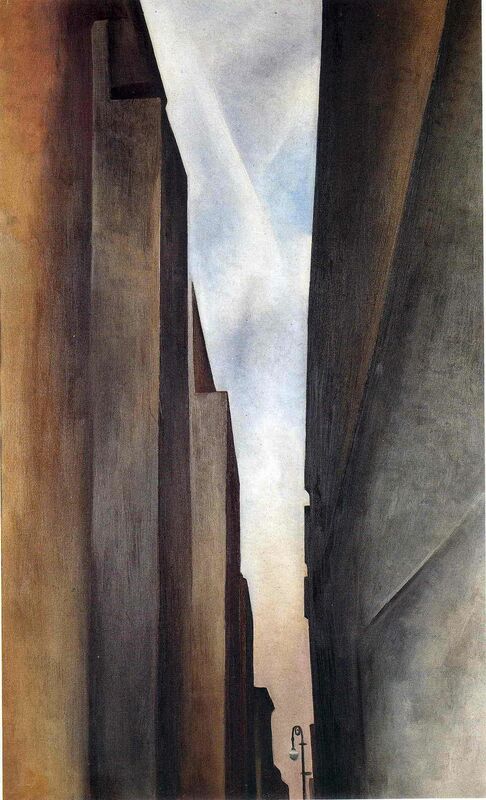 Street, New York I (1926), one of her rare cityscapes–a wide angle view of the city–is a walk down a canyon, artificial and constricting, but there is an out of scale lamp, deliberately enlarged as if to insist upon a human presence, to guide the viewer to an endless end of the street. The buildings, brown and abstracted, as in a Hugh Ferris drawing, are without windows, blank-faced and impersonal, possibly predicting the retreat of the artist to the deserts of New Mexico a few years later.The Shelton With Sunspots (1926) imagines a large orb peering out from behind her hotel and biting off the top of the oblong monolith in a haze of light. However, Radiator Building, Night, New York (1927) is her masterpiece as she stares at the black outline invented by Raymond Hood, undaunted by its shiny black surface and its golden bronze trimmings. The Radiator Building was completed in 1924, one year before the famous “art deco” exhibition in Paris. Today we take the design of skyscrapers for granted, if only because there are so many, but, in these early years, there were debates among architects as to the appropriate designs for these new buildings. The possibilities of steel beam construction which allowed theoretically limitless height and the public acceptance of the elevator to transport them safely to the upper floors made it possible to erect taller and taller buildings. The air above a plot of land suddenly became extremely valuable and it was profitable to build upwards on a small lot rather than build out or expand on a larger area. Raymond Hood, a small man who liked milk and ginger cookies, proposed that the city purchase tracts of land where skyscrapers could be grouped together in a stone and class forest. Given the real estate situation, expensive land and expensive construction, the most efficient and economic shape for an office building was to be tall and narrow, as evidenced by the famous design by Renzo Piano, the “Shard” building, a tall triangle of glass, cutting into the London skyline. But one hundred years earlier, such a simple solution was unattainable. Whereas today, we can clearly comprehend that the office building is merely the horizontal factory turned on its side, windows, glazed walls and all, at the turn of the century, only Walter Gropius and Adolf Meyer used that solution to design a new building, seen below, for the Chicago Tribune newspaper. Indeed this competition of 1922, asking architects all over the world to submit entries for “the most beautiful office building in the world” to house the Chicago Tribune, provides a synopsis on early endeavors to design a skyscraper. The newspaper was wealthy enough to offer $50,000 as first prize and the size and prestige of the prize attracted the best architects in the world. The twenties was the quintessential decade of modernist design but, while architects, from Walter Gropius to Le Corbusier, were mastering the art of mass housing and domestic architecture, the tall building was a new and, to many of these famous architects, seemingly alien challenge. James Reynolds. John Howells and Raymond Hood’s Tribune Tower. The conceit was that the skyscrapers would be the cathedrals of their age, a vast cultural endeavor that marked an era. In reality, the skyscrapers were monuments to free enterprise and business, appearing at capitalist nodes around the nation, hardly the social equivalent to the community enterprise of cathedral construction. The paradox of the Gothic resurrection on the occasion of the rise of the most modern of buildings is ironic, and it is clear that the architects were thinking in basic terms, something like “tall” and “straight,” which might explain why Adolf Loos–of all people–submitted a tall Doric column mounted on a multistory square base to the competition. The strange combination of cube and column, so ungraceful, and so unmodern, and so uncharacteristic of Loos was an indication of how difficult it was to conceive of the architecturally appropriate motif for “tall.” The second prize went to a building often considered superior to that designed by Hood. Eliel Saarinen worked with partners Dwight Wallace and Bertell Grenman on a structure that did not evoke the Gothic and suggested a crown of Greco-Roman pediments. One of the most imaginative skyscrapers and the design most in keeping with today’s sensibilities was submitted by Bruno Taut who proposed a glass spire, shaped like a tall Bent Pyramid, somewhat similar to Norman Foster’s famous “Gerkin” cucumber shape arising from the streets of London. The design of skyscrapers was also driven by demands beyond that of height. The city of New York passed a series of regulations in 1916 that forced architects to design buildings that “stepped back.” A perfectly straight building, built out to the curb, would block out air and light, turning New York or Chicago into a dark and gloomy domain where the sun would struggle to find its way around the unrelating towers. A woman used to the wide plains of the Midwest, O’Keeffe understood the importance of the sun glowing around the top of the Sheraton. The inhabitants of the city could live in a somewhat more natural environment. But the demand to step back wrought the solution of ungainly tiers stacked one on top of the other, each stage successively narrower and smaller. Once again the result was like an early Egyptian stack of mastabas, or, as some noted, a wedding cake. Many architects attempted to make the step back regulation into an actual architectural motif; but a rule is not a design form. That said, the Radiator Building of Raymond Hood successful suppressed the impression of recession while bowing to the hybridity of times that demanded historical solutions to modern problems. 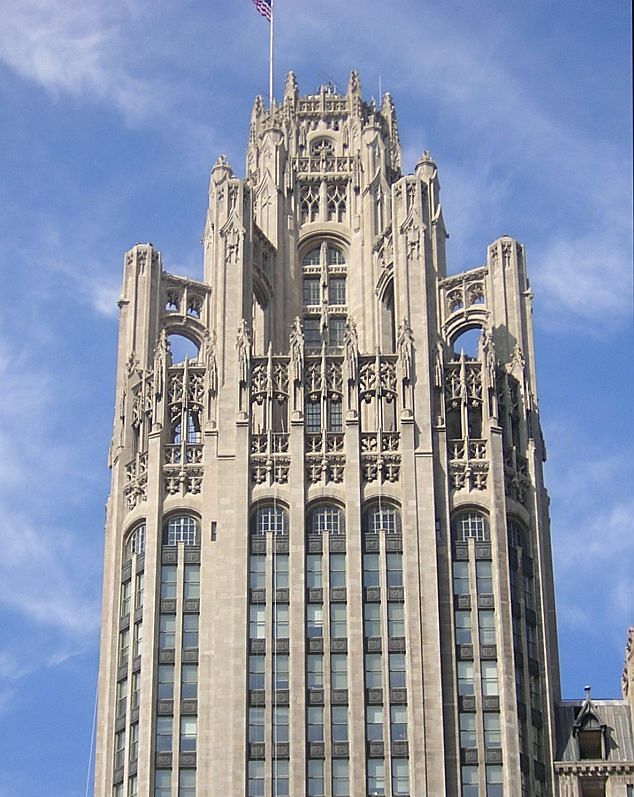 Although Hood was already successful, thanks to the Tribune Tower commission, he was not famous in New York until the Radiator Building. A decade earlier, during his thirties, the architect had made a living putting together a series of small design jobs one of which was designing radiator covers for the American Radiator Company. The radiators manufactured by the company were made of cast iron rather than steel and perhaps needed handsome covers, but the twenties was actually a golden age of radiator covers which were very handsome and inventive in hiding the necessary appliance allowing the source of heat to blend into the interior design of the home. Then the rest of the building was black brick, more matte and uninflected. Hood demarcated the shift from granite to brick with a horizontal line of bronze allegorical figures. After a straight rise of black, the step backs were at once denied and asserted and, from the fifteenth story on, were crested with golden embellishments, both vertical and horizontal. The Landmarks Preservation Commission continued, “Above the fifteenth story the sides are indented at the corners to create small recessed bays in which windows are located. The corners at the front of the building are beveled to give a shaft-like effect to the main portion of the tower. The upper part of the building can be easily viewed from three sides.” The strong contrast between black and terra cotta gold caps covering the spires led the eye upward towards clusters of golden ornamentation. At night the building was lit and the black slab glowed in the dark, leading imaginative spectators to compare the glow to that of coal or a source of heat. But Hood wanted only a solid black monolith with a golden crown, a very daring leap for the historically hampered skyscraper. His very inventive solution was only slightly Gothic and was considered quite original and stunning. 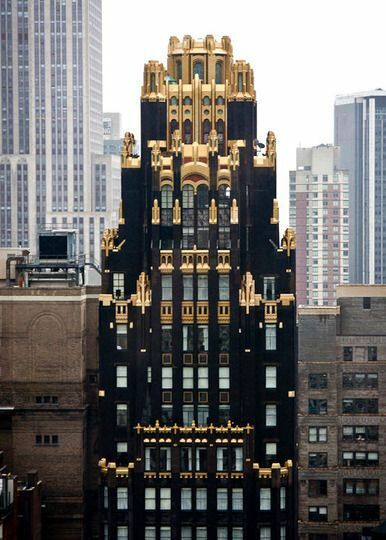 Anthony W. Robins in his book, New York Art Deco: A Guide to Gotham’s Jazz Age Architecture, quoted The New York Times as saying that the Radiator Building was “Unlike any office building in the country, the new structure is faced entirely with black brick with golden colored stone trimming, worked together to give a rich black and gold decorative effect.” The Art Deco style that was being developed in France would favor black and gold as the signature colors for architectural design. Gordon Theisen described O’Keeffe’s homage to Raymond Hood as “Tall and dark against a velvet blue night sky shot through with beams of light, O’Keeffe’s Radiator Building is bursting with electric life shining bright from a hundred-odd windows, from the vestibule on the bottom floor all the way up to the glowing crest at the top..the Radiator Building itself erected only a few years before O’Keeffe’s painting prepared the way for taller and heavier buildings, buildings yet more assertive of the greatness of this city’s rising destiny.” Indeed in his book, Staying Up Much Too Late: Edward Hopper’s Nighthawks and the Dark Side of the American Psyche, Theisen noted that the next sensational building would be the Empire State Building. The next chapter of Jazz Age architecture would end the exciting twenties and begin the dour thirties with a race between the Chrysler Building and the structure that would be climbed by King Kong. But most importantly, just as Hood’s achievement was to break away from historicism and the hold of the Beaux-Arts demands, these new skyscrapers of the early thirties would announce the arrival of the French style on American soil: Art Deco.